Introducing Norwalk Now: Norwalk Now is a collaborative marketing group comprised of Norwalk businesses who have come together to bring you their city – in real time. Founder, Linda Kavanagh shares the vision behind this exciting new marketing collective. Every time I crack an egg open I can’t resist the temptation of putting forth my only-funny-to-myself impersonation of Julia Child a la “The French Chef -Elegance with Eggs” episode. She makes a mundane omelet worthy of an elegant dinner with an “added green salad, crusty bread, and white wine.” From the black and white TV cooking show days of this culinary grande dame to our current day food culture, the almighty egg continues to be a chef’s inspiration and a consumer’s guiltless pleasure. With the U.S. producing upwards of 75 billion eggs a year, about 10 percent of the world supply (China is the largest producer), this versatile and flavorful source of protein and numerous other healthful benefits, continues to reign supreme on menus throughout the country. A visit to the coastal community of Norwalk and the restaurants of Norwalk Now proved to be a great place to illustrate the abundance of egg-centric preparations, a-typical and otherwise, finding their way onto our plates. We love the Killer B mantra of Burgers-Bacon-Bourbon-Beer and now we’re topping it off with a fifth dimension - eggs. Most notably, their therapeutic Hangover Burger capped with thick slab bacon, gooey American cheese, and a fried egg all atop a jumbo English muffin – the ultimate “constructed” breakfast plate. KB’s SoNo Sunrise Burger is layered with avocado, lettuce, tomato, onion, pickles, and a special sauce that is only enhanced by the runny yolk of a fried egg. Messy and fabulous! A beloved Southern Italian peasant dish, Eggs in Purgatory is a featured brunch item at Bar Sugo. Here, fresh eggs are poached in a sweet, and slightly spicy tomato sauce that incorporates caramelized onions and butter to give the sauce a velvety rich texture and to cut the acidity of the tomatoes. The dish is flecked with grated parmesan cheese and served with toasted garlic bread for sopping up this ridiculous goodness. Beach House SoNo brightens and lightens things up a bit with their popular Open-Faced Avocado Toast. 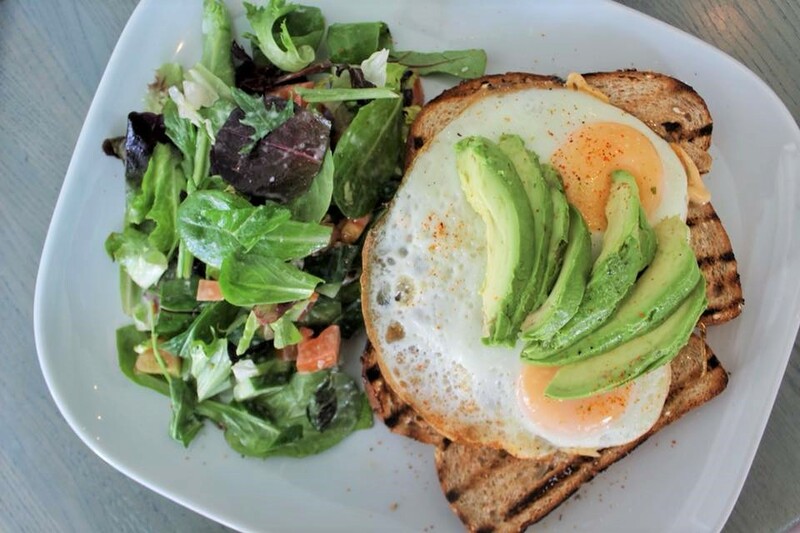 Served on hearty multigrain toast, two sunny side up eggs are given a slight kick with a smoky chipotle mayo and topped with slices of ripe avocado. The flavor and texture combination here is bliss. Savannah Shirred Eggs at Peaches Southern Pub & Juke Joint is a low-country cuisine favorite. In good ol’ southern casserole form, this decadent egg dish is filled with house-smoked tasso ham, spinach, and smoked gouda with the whole eggs cooked right into the mixture. Thick slices of Texas toast for dunking into this rich mélange of flavors is the way to go here. In pure Washington Prime style, a classic dish is elevated to the umpteenth degree as seen with their Prime Steak Tartare, a brilliant combination of diced prime beef, shallots, parsley, and parmesan, accompanied by a creamy truffle sauce and a raw quail egg presented in its beautifully marbled shell. The dish is further enhanced when the delicate egg is poured over the tartar and the truffle essence is mixed in as well. Coax this insanely flavorful and creamy mixture onto crisp toast points and all is good in the world…and in Norwalk.